Early Childhood Day of Action in Harrisburg June 3! Next week, on Tuesday June 3rd, hundreds of advocates for early childhood education -- staff, teachers, program directors, parents, early intervention workers, and more -- will stream to the state Capitol in Harrisburg for an annual day of advocacy. In the morning there will be information sessions and you'll visit your state representative and/or state senator with other advocates; at 2 PM there will be a rally in the Capitol Rotunda. Click here for more information on the day. So PCCY can match participants with legislative visits, please register here! At least three buses are scheduled to leave from the Southeast. To reserve a seat on a bus, you must fill out and return this form. Women in the military and women in military families serve and sacrifice for our country every day. It only makes sense that we should give them the support they deserve in return, especially when it comes to important health benefits. 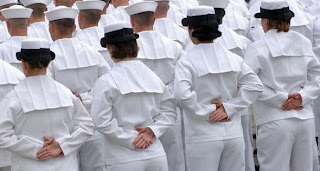 Unlike most women with private insurance plans - which must cover breastfeeding supplies and counseling - military women and military families lack comprehensive insurance coverage of the same supplies and support under the Department of Defense's TRICARE health care program. In fact, TRICARE only covers a breast pump in extreme circumstances for most women. But a bill currently before Congress would make sure all military women and military families have better coverage of breastfeeding supplies and education. JustGive, a nonprofit organization whose mission is to increase charitable giving, just processed its one millionth donation on its website. The lucky recipient of that donation? We reached a major milestone in the history of JustGive last week when we processed the one-millionth donation on our website. Who was behind this auspicious donation? His name is Al Danish, and he hails from Glen Mills, Pennsylvania. Al made his donation to PathWays PA, a nonprofit dedicated to helping to keep low-income, vulnerable women together with their children by offering programs and services that help families stabilize their lives. “If my donation can help in a small way, then that makes me feel good,” Al said about helping PathWays. To read more of the story, please visit http://blog.justgive.org/2014/05/27/one-million-donations-and-counting/. To make your own donation to PathWays PA, please visit https://npo.justgive.org/nonprofits/donate.jsp?ein=23-2001837. PathWays PA and Barnaby's of America are Partnering to Serve Our Military! 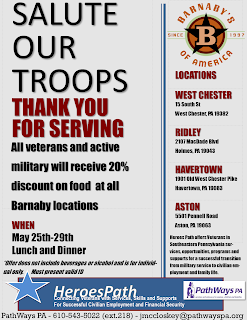 Unitl May 29, Barnaby's of America locations are celebrating Memorial Day by offering a 20% discount on food purchases for active and veteran military with valid ID. This discount is offered by Barnaby's in conjunction with PathWays PA's HeroesPath program. HeroesPath offers veterans in Southeastern Pennsylvania one-stop access to a full range of services, opportunities, programs and supports for a successful transition from military service to civilian employment and family life. Through HeroesPath, veterans can connect with a Veterans Navigator, who can provide comprehensive access to training, resources and services required for a healthy transition to civilian lifestyles. Navigators meet with veterans individually and in small groups to help veterans identify and achieve personal and career goals. To learn more about HeroesPath, please email heroespath@pathwayspa.org or call 610-237-3866. The Half in Ten Education Fund this week launched www.talkpoverty.org a new blog and website to educate the public on poverty and solutions to dramatically reduce it. Please help spread the word! Here are some sample tweets you could share with your networks. 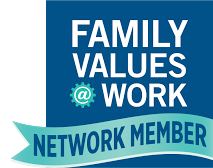 Webinar Wednesday for Advocates and Online Benefits Applications! The Coalition for Access and Opportunity is a collaboration of advocates, researchers, and practitioners working to improve access and coordination of the range of federal income and work supports. The Coalition is sponsoring a series of webinars. 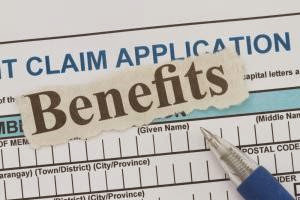 The next one will be Wednesday, May, 21 from 2:00PM to 3:00PM focusing on online public benefit applications. Online applications can be very helpful to working participants and those with limited mobility; however, when poorly designed, they can act as barriers to access. Many states are in the process of revising their systems due to the changes required by the Affordable Care Act, so this is a critical time to pay attention to online applications in your state. During this webinar, participants will hear from Ty Jones of the Center on Budget and Policy Priorities, who will discuss tools and tips advocates can use to engage their state on online application concerns. Please, no matter what else you are doing on May 20, if you are registered to vote in Pennsylvania, make time to get to your polling place. No matter who you vote for, vote like your future depends on it. Who is Running for Office on May 20? On May 20, you will be able to vote for primary candidates running for Governor, the State Legislature, and the US House of Representatives. There may also be special ballot questions and local elections. You can look at a sample ballot for your polling place at SmartVoter.org. IN MOST CASES, YOU WILL NOT NEED IDENTIFICATION TO VOTE IN THE NOVEMBER ELECTIONS. The Voter ID law has been overturned and is no longer in effect. Only first-time voters, voters using a new polling place, and voters using absentee ballots will need to provide ID. No one should have to choose between staying employed and staying safe. Join the National Partnership for Women & Families (@NPWF), Half in Ten (@halfinten), Futures Without Violence (@WithoutViolence), Legal Momentum (@LegalMomentum), National Alliance to End Sexual Violence (@endsxlviolence) and National Network to End Domestic Violence (@nnedv) for a tweet chat on Today, May 15th at 2:00 pm about the intersection of economic security and domestic violence and sexual assault. Tomorrow, at 3:30PM, the PBPC will host a webinar will special guests, State Senator Vincent Hughes and State Representative Gene DiGirolamo to discuss the current outlook on budget negotiations. Budget negotiations will move quickly and could end with another austere budget on June 30th. There is bipartisan interest in raising revenue, but cuts are inevitable unless there is vocal public opposition. Lucian Perkins: A Future for homeless children from Facing Change on Vimeo. Every year, over 6,000 PA infants from 0-3 years old are classified as homeless. Senator Chuck McIlhinney has recently proposed legislation that would help these children be tracked by Early Intervention Services with the goal of ensuring that these children can be screened and monitored for developmental delays, emotional and behavioral problems, and other issues that may affect them negatively throughout their lives. If you support this issue, please call your Senators today and share your support. There is information below that can help you make your case. Join Us Tomorrow to Ask for an Increase in the Minimum Wage! PathWays PA will be joining with advocates from all over Pennsylvania in a statewide push to raise the minimum wage tomorrow. Please join us at 10:00 AM tomorrow where workers will testify before a Democratic policy hearing at Cabrini College, asking the legislature to vote on an increase in the minimum wage. Cabrini is located at 610 King of Prussia Road, and the hearing will take place in the Grace Hall Boardroom . There are ONE MILLION low-wage workers in Pennsylvania who could use the boost from a higher minimum wage. PathWays PA is a member of the Raise the Wage Coalition, seeking in increase Pennsylvania's minimum wage to $10.10. 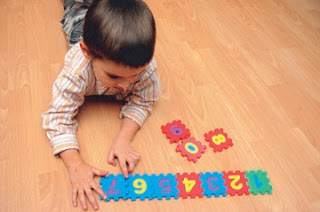 Ask Your Legislator to Support Early Childhood Education! The General Assembly and governor have less than two months to agree on a budget by the June 30 deadline. 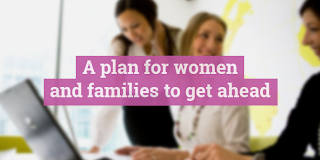 It is critical we make our voices heard to protect and increase investments in early care and education. It is important for state legislators to hear from you now in support of increased early learning investments. Click here to send a message to your state legislators in support of additional funding for early learning programs in the state budget. PathWays PA works closely with PCCY on early childhood education initiatives and policies. The event will take place this Monday, May 5, from 2:00PM-4:00PM in room 108 of the Philadelphia Free Library Parkway Central Branch located at 1901 Vine Street. Equal PayPaid LeaveCompensation/WagesNegotiation Register for the event by calling the Women's Bureau at 215-861-4864 or sign up online. All attendees will receive a negotiation checklist to take home with them.